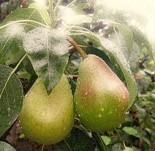 My Old Father used to say that “you plant pears for your heirs”. This may have just been his North England pragmatism shining through but he had a point then – but not now. Planting fruit trees now will repay you almost from year one. Whether it is apples, pears, plums, greengages, peaches or nectarines, it is never too early to plant your own orchard and thanks to the different rooting stocks you can have fruit trees to suit the size of every garden and most of the soils. The choice of variety depends on what you like but if it was my garden, I would start with ‘Victoria’ plums to eat straight off the tree, and 'Bramley’s seedling’ apple for crumble, ‘Egremont Russet’ to eat off the tree, and a greengage for jam.